I write a lot about our need to sit still, but to be honest, it is not something I am good at. At least that is how I have viewed it in the past. I fidget, I move things. I play with my candles and if I am well enough organized, I knit. I think my problem is that I have misunderstood the concept of stillness. Stillness does not always mean motionless. It is more of an inner than an outer discipline, an exercise in learning to pay attention to the now rather than the was or the will be. Meditation and mindfulness are the terms often used for this process today. It can be a powerful spiritual tool and one that does not require special space, special skills or special devises to make it happen. 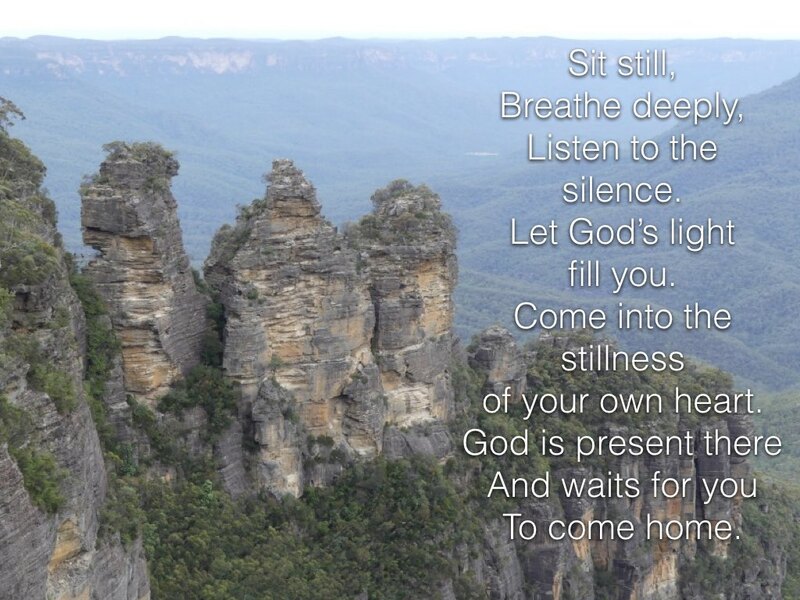 We can all find stillness and enter into the presence of God a hundred times a day. Here are some thoughts on how to accomplish this. Sit comfortably with your feet firmly on the ground. You might like to close your eyes. Take a deep breath and exhale, imagining that you are expelling all your anxieties and pressures with that breath. Come to rest, calm your mind, relax your body. What are you thinking of right now? Hold onto that thought and allow it to become the focus of your attention. For some looking at an object, real or imagined, may enhance the ability to focus. Others may find that activities like doodling, colouring, writing, knitting or whittling bring that thought into greater clarity. Take a few more deep breaths in and out deliberately breathing in your thought into and out of your body. Enter the place where God waits. 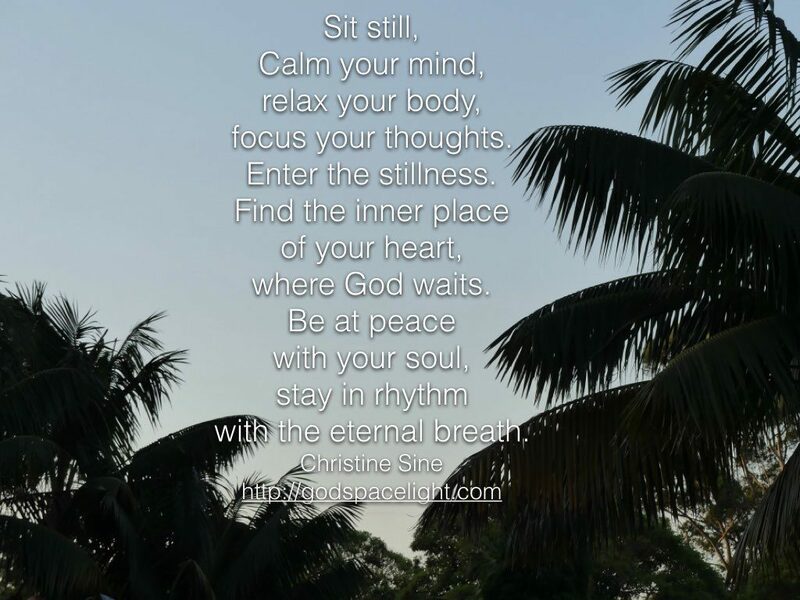 I love to imagine God waits in my heart for me to enter the inner place of soul quietness where my soul and spirit are at peace with the rhythm of God’s breath. And as I enter that place I find myself spontaneously clasping my hands, closing my eyes and bowing my head. It may only last for a few seconds, but in that brief moment there is a deep and profound connection to the living God. Writing down and meditating on what I hear God say in these quiet moments is one of the most profound spiritual experiences I have on a regular basis. It keeps me grounded in my faith and inspired in my work. It is here that I often write the prayers I share on this blog or start new creative practices for the coming seasons. Act on what you hear. It is the prayers and creative practices that come to me during these times that then become the focus for future God moments of stillness and contemplation. I don’t always expect such results from my times of stillness but when they come they are a gift that I receive with gratitude and continue to thank God for as I use and reuse it. Like the prayer above and this one which has come to me in still moments over the last few days. Why Do I Believe in the Resurrection? An eminently helpful and inspiring word. Thank you, Christine! Thank you for sharing these beautiful thoughts. I have heard Jesus whispering very similar thoughts, as He says, “Come inside with me, where I am already dwelling in you.” I appreciate so much the confirmation that your words have sent my way, as the word that God has given me for this year is “stillness.” Blessings to you! Bettie, thank you for the encouragement and affirmation of what I write about. Would love to hear what emerges for you as you think about stillness. I am grateful you helped me understand that I can be in motion physically, and in the divine stillness internally, with my “mind in my heart.” Thank you. Thanks Ted. Someone reminded me yesterday of Tai Chi which is sometimes called Meditation in motion. Has stirred a lot more thoughts in my mind about how we can, and should incorporate movement into our meditation.